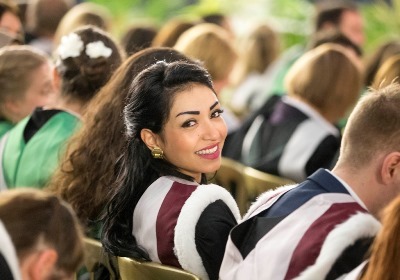 More than 1000 University of Stirling graduands will have their achievements recognised at three Summer 2015 graduation ceremonies today and tomorrow. The ceremonies, held on campus at the University’s Gannochy National Tennis Centre, will confer degrees and academics awards upon graduands from the seven academic schools. University Chancellor Dr James Naughtie will preside over the graduation ceremonies and Professor Gerry McCormac, Principal and Vice-Chancellor, will stress the importance of leadership qualities and employability skills gained at Stirling. More than 80 percent of those receiving an honours degree at this week’s ceremonies will graduate with either a first or 2:1, while 94 percent of Stirling graduates are in employment or further study six months after graduation. The ceremonies are broadcast live via a graduation webcast. Graduation coverage – packed with photos, social media and case studies - will also be available at our dedicated webpage Graduation Summer 2015 Live. Graduands from the School of Education and Stirling Management School will receive their awards at the opening ceremony. This includes First Class BA Hons Business Studies and Economics graduand Thea Brønlund, who is about to start as a Global Market Data Analyst with Bloomberg and Education PhD Denise Mifsud, who completed her degree through distance learning from Malta. Sir John Elvidge, former Permanent Secretary to the Scottish Government, will also be recognised with an honorary doctorate for his outstanding contribution to the wellbeing of the people of Scotland and his dedication to the Modernisation of Public Services. The Wednesday afternoon ceremony recognises graduands from the School of Arts and Humanities and the School of Sport. Law graduand Amy McCormick converted her University work placement into her work place, having already started her new role as a Risk Officer at Airdrie Savings Bank. Sports Studies graduand Hannah McCook, is one of 13 graduands who received support through the University’s International Sports Scholarship Programme, alongside fellow golfer Jack McDonald and Commonwealth Games medal-winning swimmers Cameron Brodie and Jak Scott. Artist and playwright John Byrne, best known for his 1978 play The Slab Boys and multi-BAFTA award-winning 1987 TV series Tutti Frutti, will receive an Honorary Doctorate for his distinction in the arts. Graduands from three schools will receive their degree scrolls at the final conferment ceremony on Thursday: the Schools of Applied Social Science, Health Sciences and Natural Sciences. It will be a hat-trick of Stirling degrees for a former Hollywood and UK TV industry employee Mark Grindle, whose PhD from the School of Health Sciences builds on two Film and Media qualifications in 1989 and 1994. Honorary graduands at the final ceremony are broadcaster Sally Magnusson, who will be recognised for her outstanding contribution to Scottish life and her support of the University’s Dementia Services Development Centre, and former University Secretary Kevin Clarke.